I maded you a FractLOL… and then I Silverlit it! Click the preview image to begin… then Click, drag, shift-click and use the mouse wheel to see that the image is made of over 10,000 LOLCats (there are 2,442 unique images here). Here is the full-browser FractLOL. You can also click the button on the corner of the FractLOL to go full-screen, but then you can’t use your mouse wheel, due to silly Silverlight shenanigans. 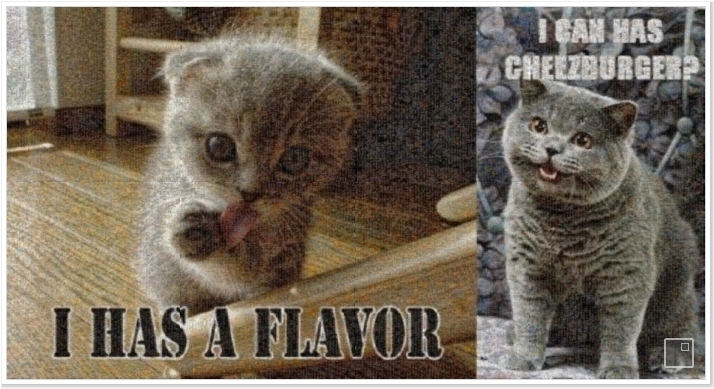 The FractLOL consists of 2,442 unique kittehs and over 10,000 LOLCat images, all stitched together into the likeness of two famous, zoomable LOLs. This giant image took over forever to be generated, but thanks to Deep Zoom, you can pan and zoom around the super-high-res image in real time. LOLCats seem to be funniest when consumed in bulk, and the FractLOL contributes a srsly cool way to explore thousands of examples of teh best creashuns of teh intarwebs. If, for whatever reason, you can’t install Silverlight to see the FractLOL, it looks like this. The kittehs are from the very awesum icanhascheezburger.com. The photomosaic was generated using AndreaMosaic, a utility for making fun images like this one. The output of AndreaMosaic got processed by Deep Zoom Composer and turned into a Silverlight app. The app was then uploaded to Silverlight Streaming which lets me host these kittehs on the intarwebs without bringing mai wee server to its knees (i hope i hope i hope). That’s enough LOLSpeak out of me for a very long time. u has any comments 2 share?